The “Mahler Unleashed” series of 19 concerts got underway at Jordan Hall last night, prompting this writer to concede that NEC President Tony Woodcock may have been guilty of understatement in his boast that “Only NEC could conceive and promote this festival.” We heard in the results evidence of an interdisciplinary approach only possible at an institution of NEC’s stature. 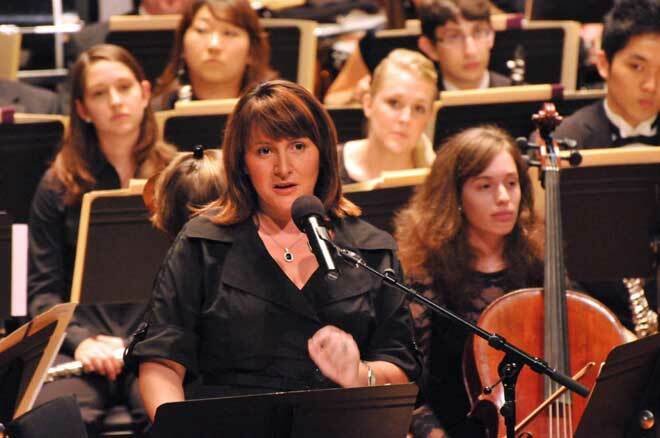 When Katarina Markovic, chair of the NEC Music History and Musicology Department, proposed including part of her dissertation topic, a study of the first version of Mahler’s first symphony, in a festival, Woodcock wisely got behind her and let her run with her idea. Her student Kristo Kondakci, NEC ’13, spent all summer and more transcribing every note and interpreting every smudge from Mahler’s 1889 manuscript into new orchestra parts and a new conductor’s score. He did this with guidance from his professor and from Hugh Wolff, NEC’s Stanford and Norma Jean Calderwood Director of Orchestras and Chair of Orchestral Conducting, who is a noted Mahler interpreter. Then it was the turn of the very talented players of the NEC Philharmonia to get involved in the first performance of the original version of Mahler’s first symphonic utterance since its premiere in 1889. It must be said, and clearly the capacity audience agreed, that the NEC orchestras are playing at a very high level. A certain orchestra across the street must look enviously at the very laudable situation where there is actually a vigorous young music director engaged in his work with rigor and reliability. There is also apparently a commitment to allowing sufficient rehearsal time as well as an expectation that performances will be highly polished. When Wolff signed on for a “fantastic journey” with Katarina Markovic, he was all aboard as an active participant. And the results in the actual performance affirmed his decision. He conducted from memory, which was no small feat, since he somehow had to forget the version of Mahler 1 he had been conducting for many years. Professor Markovic, in the pre-performance lecture, spoke on the differences in versions of the symphony illustrated not only by images of manuscripts pages projected on a large screen but also with the orchestra on stage as sonic explicator. We knew what to listen for when the orchestra returned to the stage for the actual performance, and so it was not a surprise to see that the orchestra had shrunk from the forces employed in the opener, Strauss’s Don Juan (also from 1889). Twelve woodwind players were not invited back. What sounded most different about this version was the lack of divisi strings. We lost an octave of shimmering harmonics and the orchestration sounded much more Brahmsian than Straussian. Then there were assorted bumpy transitions that the young Mahler later smoothed. The most dramatic of these occurred in the last movement where, according to Professor Markovic, the pedal point in D, though it gives a wonderfully eerie quality, makes it impossible for return to the harmonically distant original theme in f minor without resorting to some confusing dissonance and a verbatim recapitulation of the “horror fanfare.” Professor Markovic added that the need for this verbatim recapitulation particularly galled Mahler, whose preference was for a more natural continuous development. The performance was very well played and well paced, especially amazing for the opening concert by a student orchestra. Wolff employed admirable restraint and did not anticipate his climaxes. The dramatic moments were all well earned. The lyric portions were well sung, and the out-of-kilter dances bounced authoritatively. The bombast that we associate with Mahler was nowhere in evidence. Among the performers kudos were particularly earned by trumpeter Chuan-An Hou in the Blumine and by oboist Joo Bin Yi and horn player Clark Matthews, throughout in their many exposed passages. The entire brass section was stupendous in the finale. This was a great night for NEC. One caveat: There was a noisy intruder in Jordan Hall — an LCD projector brought in for a media-infused lecture before and between pieces in the concert that unfortunately was left running during the music. A posterized magenta and orange icon of Mahler glared down from a screen hung in front of the organ pipes. The screen was sized and placed to allow the NEC Jordan Hall sign to peek out underneath. This would merely have been crass marketing or branding if had been seen and not heard, but unfortunately the 45 -decibel cooling fan obliterated pianissimos for those within 30 feet. If projectors must be run during musical performances then they must be installed in a projection booth or swathed in a sound baffle. And finally some logistical advice for future audiences at NEC: The word has certainly gotten out about the free concerts at NEC; quite a substantial number of would-be votaries were sent packing. And there was even a substantial buzz on the subway platform after the concert — and I don’t mean Symphony station. At the grittier Mass Ave. Orange line station riders could be heard gloating about what they had just received from NEC, and the fact that it’s free! So get there early if you want a seat. Splendid concert; splendid review!!! Is there a means of emailing it to others? At this point the easiest method is just to highlight the url from your browser’s address bar and paste it into an email. Would a twitter button or a Facebook button on our site help? Professor Markovic might be a wonderful enthusiast of her affair but his presentation just did not work out at all. The idea to have a bright scholar, half hour of listeners attention, full obedient orchestra and a large projection screen solely for the presentation disposal is very stimulating but as anything else in cooking: the combination of great ingredients not necessary lead to a great soup. If Professor Markovic willing to bring the similar lectures to the upcoming concerts then I would strongly encourage to revise what and how presented. As the great contrast the presentation of Mr. Kaplan before the concert – it was conceived and executed superbly, probably due to much lighter subject. What would be very interning is to hear the very same play but in a larger stage. Hugh Wolff took a slight faster tempo probably due to the “chamber” size of the Jordan Hall that made NEC to sound a bit like Verdi orchestra. I think in a larger hall with longer reverberation time NEC would sound less “confined” and more monumental. Not that it was a problem but I would like to hear the same third and father movements were in the Symphony Hall with it’s lasher and a bit more most Sound. Anyhow, as Lee said: the orchestra across the street needs to take notes and perhaps to learn something. A quick comment on Mr. Kellaway’s question and Lee’s answer: while Lee can grant permission to copy his own articles, BMInt does not claim the copyright in the reviews and articles of others. It would not only be expedient, but I think probably essential at this point to follow the procedure he outlined. And Romy, maybe the orchestra across the street should particularly be taking more notice of the fellow on the podium at Jordan Hall. Katarina Markovic has been a great inspiration to students at NEC and scholars in general. One of the most interesting pre-concert lectures I’ve ever seen. Hi @Lee – yes, some combination of a Twitter/Facebook/Share button would be really helpful for this site, or even a Subscribe function! @Vance, would having such buttons not be equivalent to copying and pasting a link, with respect to copyright? This is a great site and I’m sure your writers (I’m related to one…) would be happy for the ability to spread the love in a convenient way, without violating their copyright; after all the links would still come back here, where the content would stay. Links are not a problem (at least not for the authors! )–that’s not part of the copyrighted text. And of course you can subscribe (as I do) via RSS to get every review and article delivered to your mail box.